BugDoc Dave again, and it’s Stretch Tuesday! Looks like Brian is having fun in Florida and I’m detecting anticipation for the Tampa Bay Carnival Glass Club Convention! Wish I could get away, but I have classes and some talks to give that week! Hopefully, Renee and I can make it next year as I’ll be retired then! Yea! Today, I’d like to finish off one of the remaining “minor” stretch glass companies, Vineland Flint Glass Works that operated out of Vineland, New Jersey. This is a really interesting company as most of the historic records refer to their production of glass made for automobiles and laboratory glass. 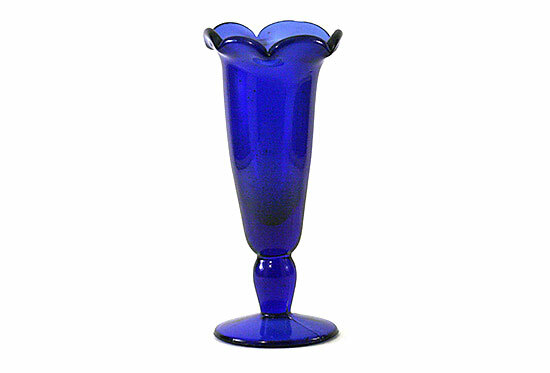 This glass was mainly crystal and often tempered to withstand temperature extremes. 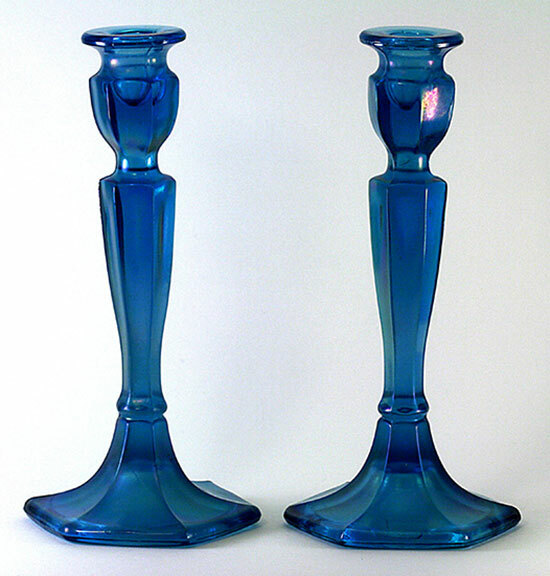 However, the company was associated with the Durand Art Glass Division in 1924 which resulted in the famous Durand Art Glass that was a major competitor with Tiffany and Steuben (and Fenton’s and Imperial’s brief use of freehand glass artisans). 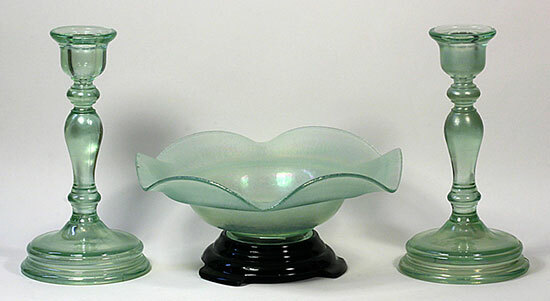 Like Jeannette and Lancaster, the Vineland stretch glass was made using a very limited number of molds. 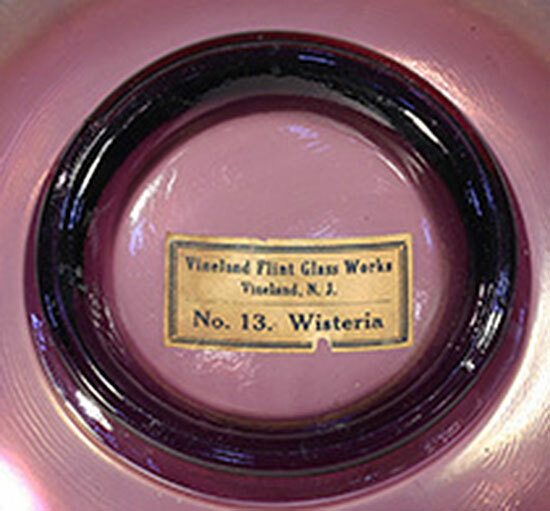 We only know of three names that Vineland used for their stretch glass colors – Old Gold (an amber glass), Tut Blue (a Celeste Blue style) and Wisteria (purple glass). These color names are known because there are about a half dozen pieces in collections that still have the original paper labels attached to the bases! This company also appears to have used different numbers to describe the different shapes given to the three bowl sizes. There are also three candleholder molds and one vase mold used. “Quality” didn’t seem to be important to the makers of Vineland’s stretch glass. In fact, it appears that the workers likely used small batches to make their stretch and these batches may have had colorants added after the tank had been used for other purposes! Green ranges from a very light green, to a Coke bottle green to a fairly nice Florentine Green type. Same with the Tut Blue. It can range from a light blue to a fairly dark and muddy color. They also used cobalt to make a light to really dark cobalt blue. Wisteria can be light to really dark purple. Their crystal stretch often has some clambroth overtones and it appears that they tried to make a pink, but most of their pink is “cooked” and looks light brown! 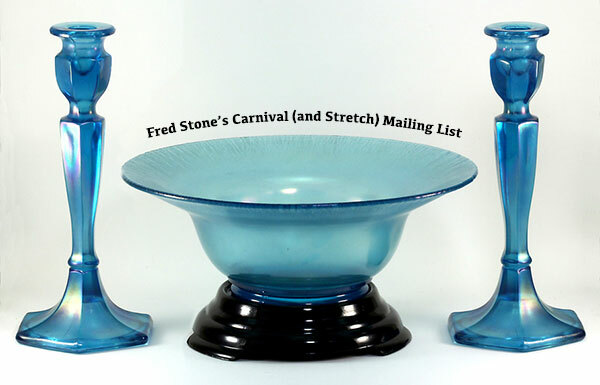 We also know of some slag colors with an iridized caramel slag candleholder known, and I’ve seen some blue and purple slag bowls that are obviously from Vineland’s molds but were not iridized. I know of three black bases that fit the three bowl bases. The bases look a lot like some of the Fenton and Northwood bases and careful measurements are needed to separate them. Another “feature” of many of the stretch bowls are chisel marks in the bases of the bowls. It appears that the workers overheated the bowl molds which can result in the glass sticking. The only way to handle this situation is to cool the mold down and chisel out the stuck glass. This can leave little marks in the iron molds! 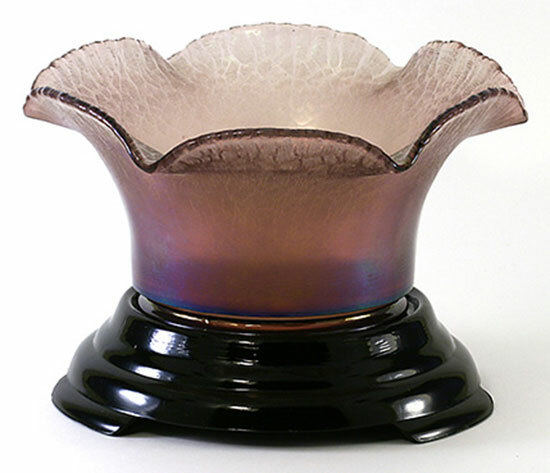 The three bowls include one that has a 2 7/8-inch diameter base, a relatively small collar and the base of the bowl flares out. 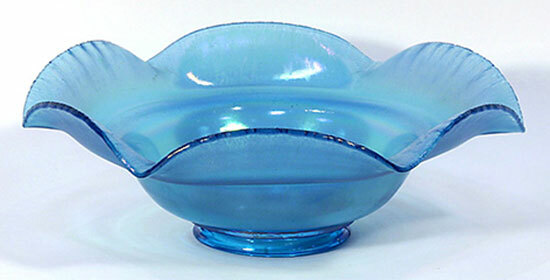 This bowl’s top can be flared, flared and cupped, or given six crimps. When flared out, these bowls are in the 8-9 inch range. 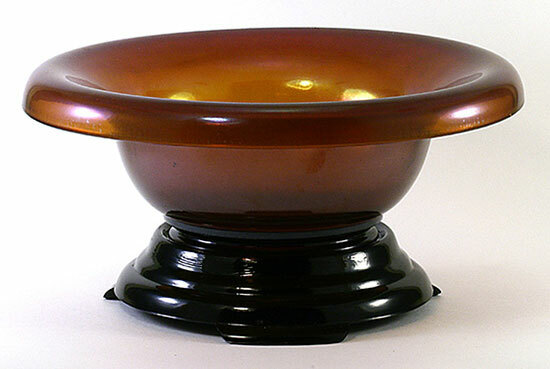 The larger bowl has a 3 7/8-inch base and these are usually flared out to the 10-11 inch range. This bowl’s top is found flared, flared and cupped, raised and cupped or flared with six crimps. The final bowl is what I call a wide-based bowl with straight sides. This one has a 4 3/8-inch diameter base and is usually in the 7-8 inch diameter range. This bowl is commonly found flared, cupped, rolled rimmed or six crimped. Unfortunately, all three bowls are very similar to Northwood and Fenton’s pieces. 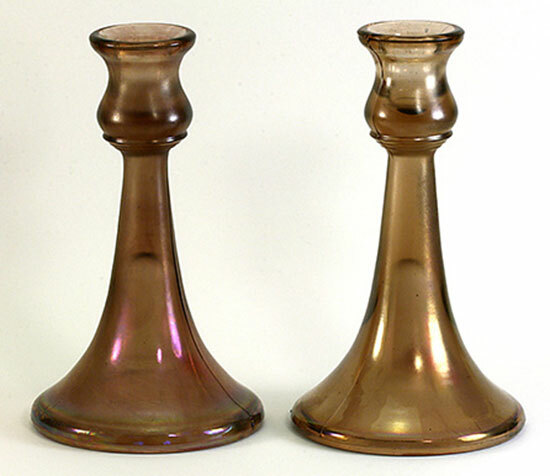 Vineland made a 7-inch tall, trumpet-shaped candleholder that is very similar to the ones made by Northwood and Central. The difference is that below the candle cup there are three rings. The Northwood and Central holders have only two rings. Vineland either used two molds to make these candleholders or they had to refurbish a mold. 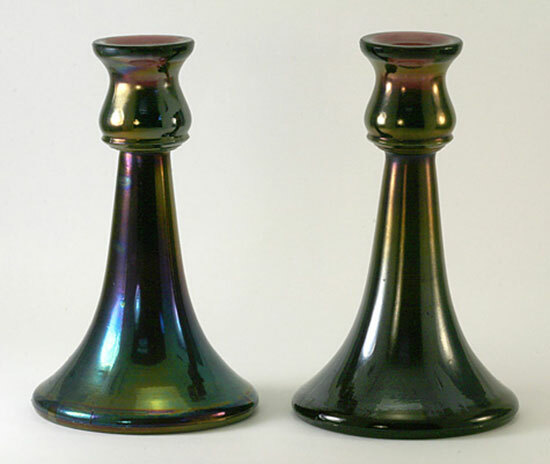 Some of the candleholders have a thin and nicely sculpted stem below the candle cup and the others have a fatter stem. 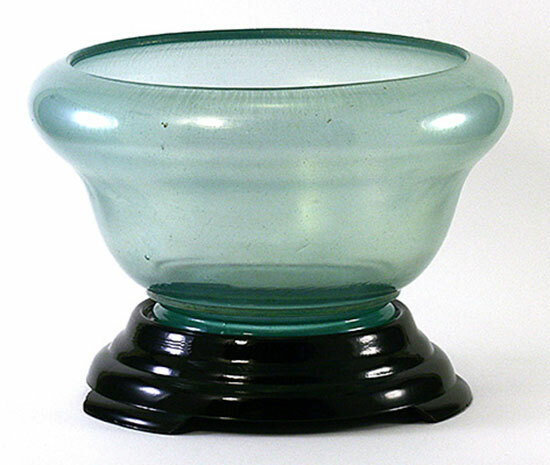 The next most common candleholder is a “colonial” or “Florentine” style which looks exactly like the Fenton #349 10-inch candleholder! However, if you look carefully, the Vineland holders were made in a three-piece mold and the Fenton ones were made in a two-piece mold. Vineland made one additional candleholder and this one is quite difficult to find. It is a “spindle” type and looks a bit like one made by Diamond or even the “Premium” one by Imperial. However, if you look closely, the wide part of the stem is at the top, not the bottom. I have only seen this candleholder in a light blue-green color. Finally, there is one small bud vase which is unique. 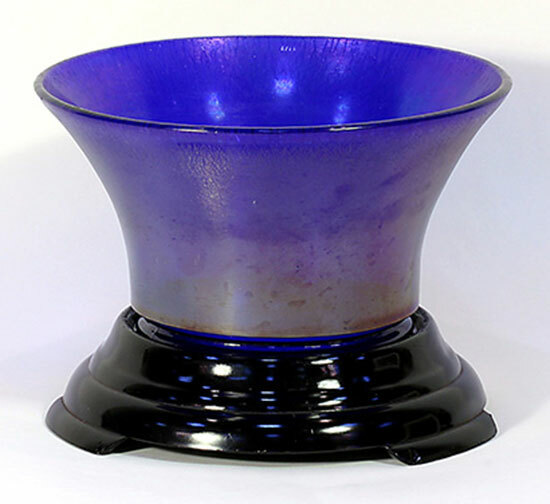 This vase generally ranges from 6 1/2 to 7 inches in height and the top is either pinched in and flared or given a 6-sided crimp. I’ve only seen this vase in a dark wisteria or dark cobalt blue.